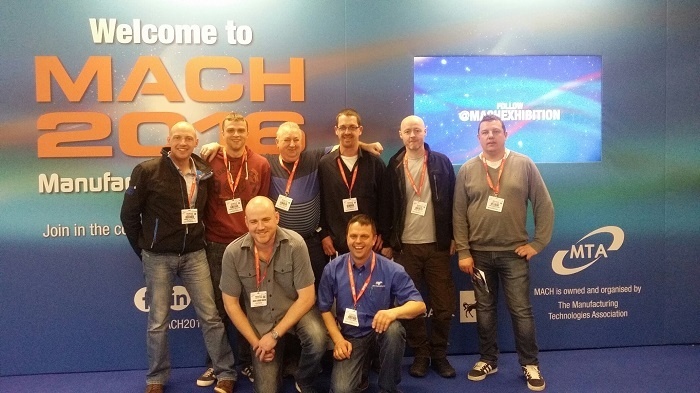 Last week, eight of our production team spent two days visiting the UK premier manufacturing technologies event, MACH 2016 in the NEC in Birmingham. The exhibition itself is a great insight into the latest and future technologies in the machining engineering industry. The Mach 2016 Exhibition was a full week of manufacturers and engineers showcasing their capabilities and discovering what’s new in the manufacturing and engineering sector in the UK. The incredible innovative ideas we saw gave us a huge boost in the possibilities for our company and what we can be capable of providing our clients now and in the future. From high tech welding to advances in 3D printing and additive manufacturing, the event introduced new concepts and clever design and was a fantastic opportunity to meet important innovators in UK industry and learn from them. Speakers included Michael Mychajiuk from Jaguar Land Rover who gave an interactive and very interesting seminar on the advances of the UK automotive industry as it is today and their plans for the future. We are already excited at the prospect of attending the next Mach Exhibition and we will continue to introduce new technologies and advanced engineering practices to keep the competitive edge we are known for.